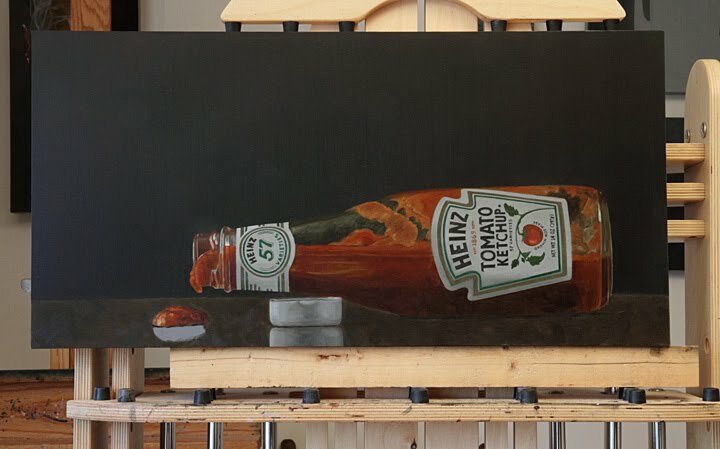 While the Ketchup Bottle and the Oranges are drying I began a third piece to put into the rotation. I did a version of the Blocks with spyglass once before and wanted to revisit it. I reached this point on the first day, and I'm hoping that I can finish up the first pass today. If I can do that, I'll be able to return to the Ketchup tomorrow. That one is going to be a challenge. Working with the labels and all that type is worrisome. Hope I can get it right. I also wanted to put in a plug for Karin Juricks' new easel. 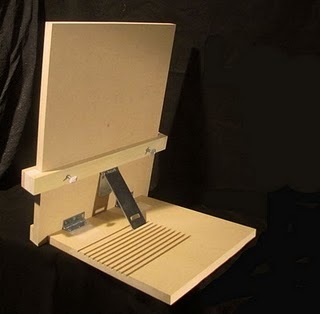 It was designed and built by her boyfriend Brett. She's been painting on the original version for seven years now, loves it, and they've decided to market them. So far it's been very successful. The first two runs each sold out in a matter of days. They're currently busy building more. To take a more in-depth look, including additional images and a description of it's features, click here. 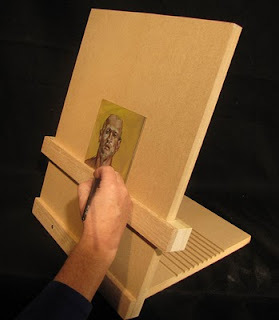 If you're in the market for a table top easel check this one out. If you decide to buy one they are being sold through Karin's ebay store. While the Ketchup Bottle is drying I started work on a second painting. The first pass on it went a little faster than I anticipated, so now I'm beginning a third painting to work on until these two dry for their second pass. I'm still trying to figure out which of my current images will be number three. I should have an "in progress" post on that in the next day or so. Day Two. 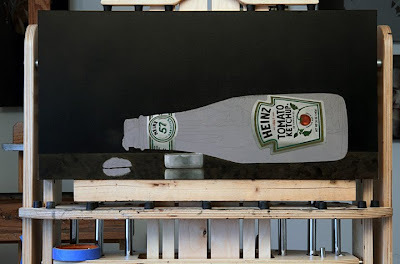 Just blocking in the reds and beginning to define the bottle. Long way to go yet. I'll be setting this one aside for a couple of days until the red dries, then I'll start in on the second pass. It's been so long since I actually painted that I feel a bit like Rip Van Winkle just awakened and it may take a little while to get my sea legs back. The last few weeks have been filled with the holidays, unexpected dental work, snow and lots of photography, so it's definitely not been a vacation. It does feel really good to have a brush in my hand again, and I'm looking forward to working on some of my new images. 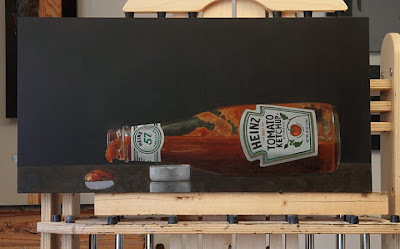 I've been a fan of Ralph Goings since forever and I always loved his paintings of diners and particularly his still life paintings of condiments on the counter. These nearly always included bottles of Heinz Ketchup . . . so, I wanted to try one myself as a sort of homage. The problem is you can't buy Heinz Ketchup in those bottles any longer, so finding one presented a problem. Fortunately a local diner, The OK Cafe (one of our favorite places to eat) still has them on the tables, and the staff there was kind enough to give me two empty bottles (cleaned up nicely) at no charge. All I had to do was fill them up again. 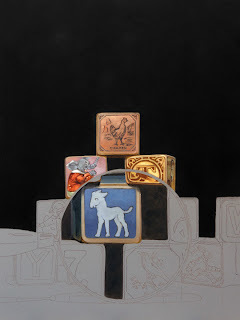 Above is the first day's work, and I'll continue to put up a series of images as the piece progress's. Karen has her work on the cover and a feature article in the January 2011 issue of The Laurel of Asheville Magazine. 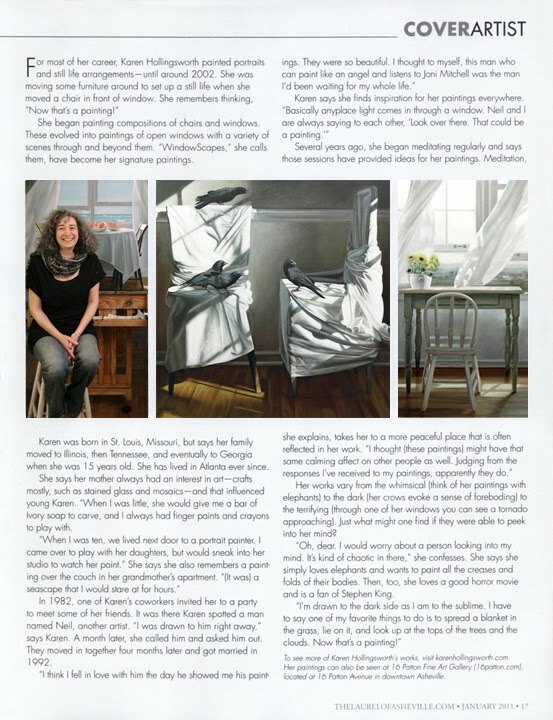 The article is accompanied by three of her paintings and there is a fourth on the table of contents page. 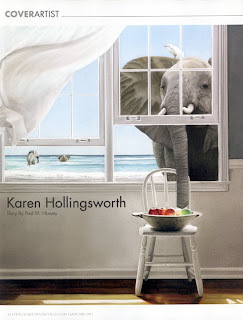 Paul Howey wrote the article and did a really nice job of piecing together Karen's responses to his questions. Karen and I were astonished at the quality of the printing. 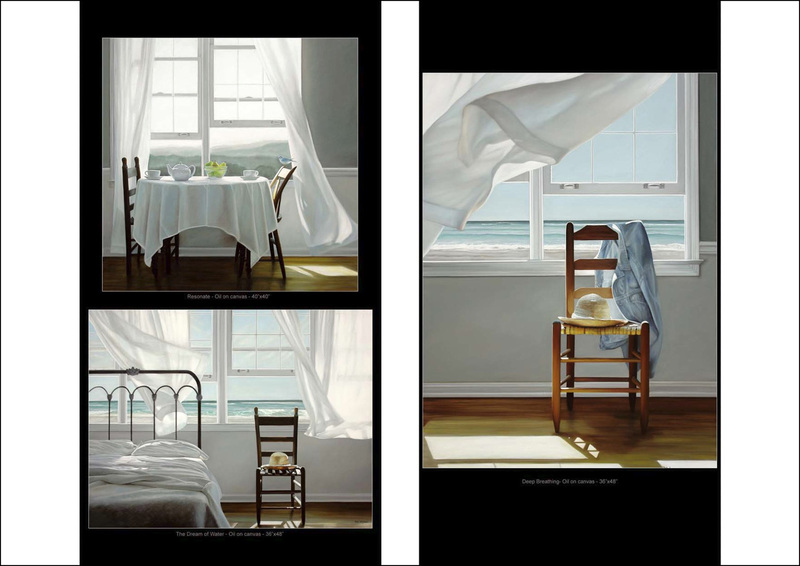 We've both been in magazines before, and usually the reproductions of the paintings is very poor. Whoever printed these did a great job. I'm still doing a lot of photography, and searching out new objects for future paintings. 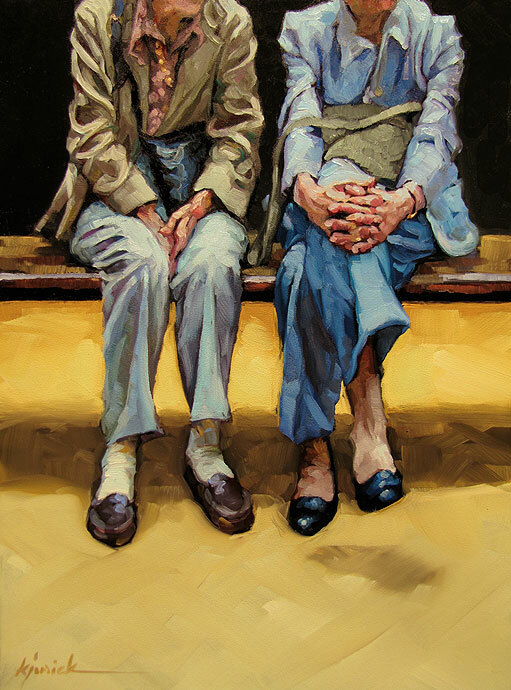 I have to say I'm really itching to get back to the easel and do some painting. 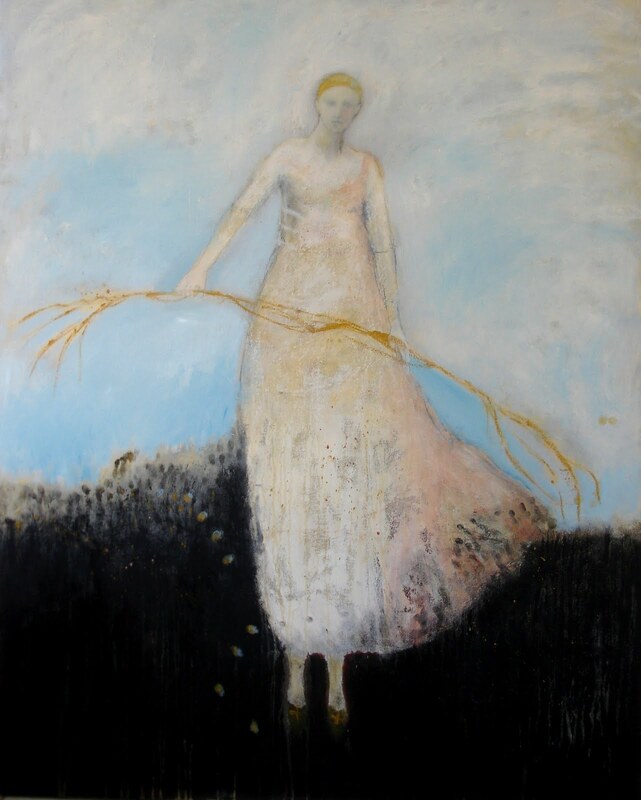 Tonight we're going to the Marietta Square to attend the opening night reception at DK Gallery of our friend Jeanie Tomanek. 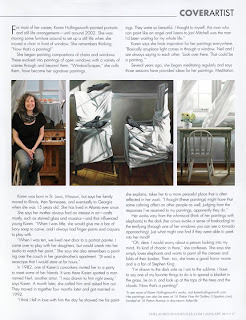 She's such an amazing person, and great painter. 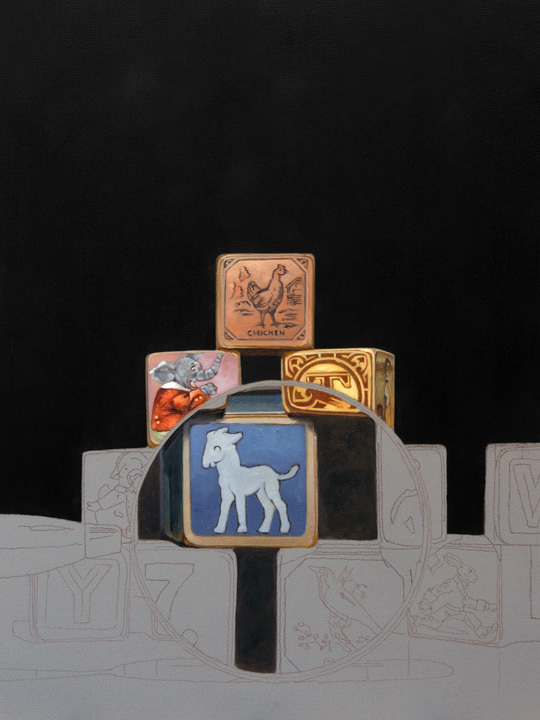 If we had more money our house would be filled with Jeanie's paintings. Addendum: We had a great time at Jeanie's show last night. Attendance was high and her work looked great. Donna, Amber and the rest of the team at DK Gallery did a terrific job of hanging the show and working the crowd. Before we left, Spinning Straw (above) had a red dot. Congrats, Jeanie. After the show ended Karen and I were invited over to Jeanie's house, along with a small group of her oldest friends, to hang out and take part in a tasting of a variety of Italian standards prepared by Jeanie's husband Dennis. A true renaissance man, phenomenal chef and all round great guy. It was a wonderful evening. A couple of newsworthy items to start the new year. 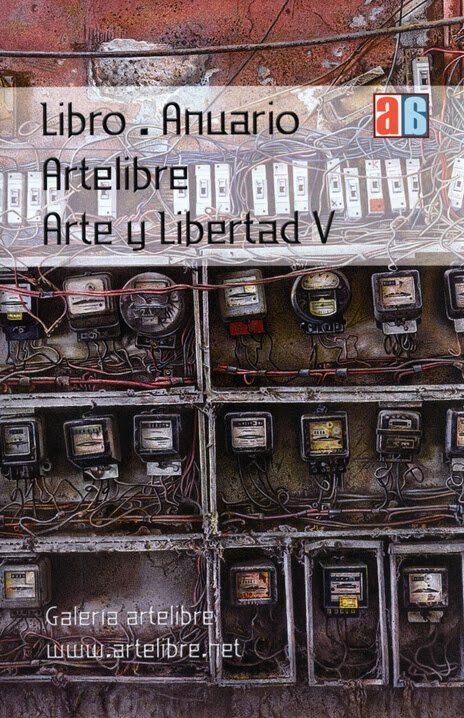 First off, Karen was invited to have her work shown in Gallery ArteLibre's fifth annual volume, Arte y Libertad V. It's a very impressive 200+ page hardback book showing the work of over 100 realist painters. She was very excited about having her work shown along with artists such as Pedro Campos, Steve Mills, Alysa Monks, Cesar Santander and Randy Ford. 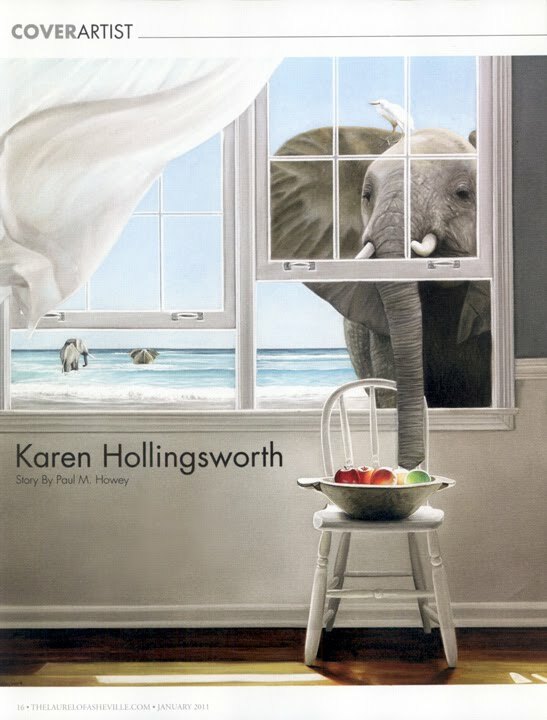 Karen got her copy yesterday and was very pleased with the quality of the printing. I'm not too proud to say that I'm more than a little envious, and would love to find my work in a future volume one day. 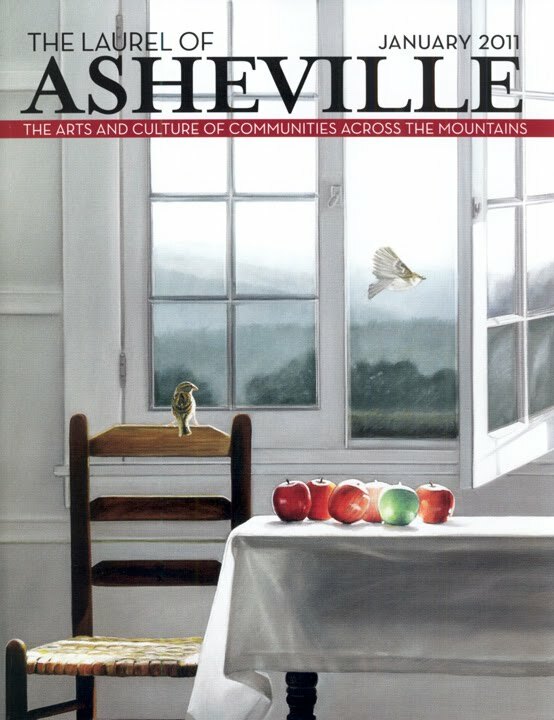 If you think you may want to have a copy for yourself, you can purchase it online direct from the gallery by clicking here. 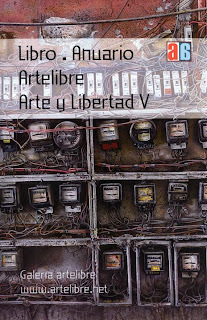 All the text is in Spanish, but it's not too difficult to figure out how to secure a copy. It'll run you 40 euros (just under $55) plus shipping. 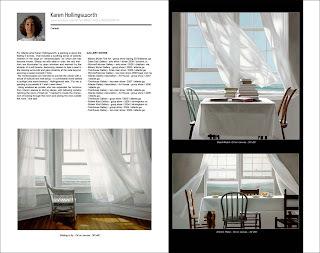 If you're a fan of realism in painting, I think you'll enjoy this book. 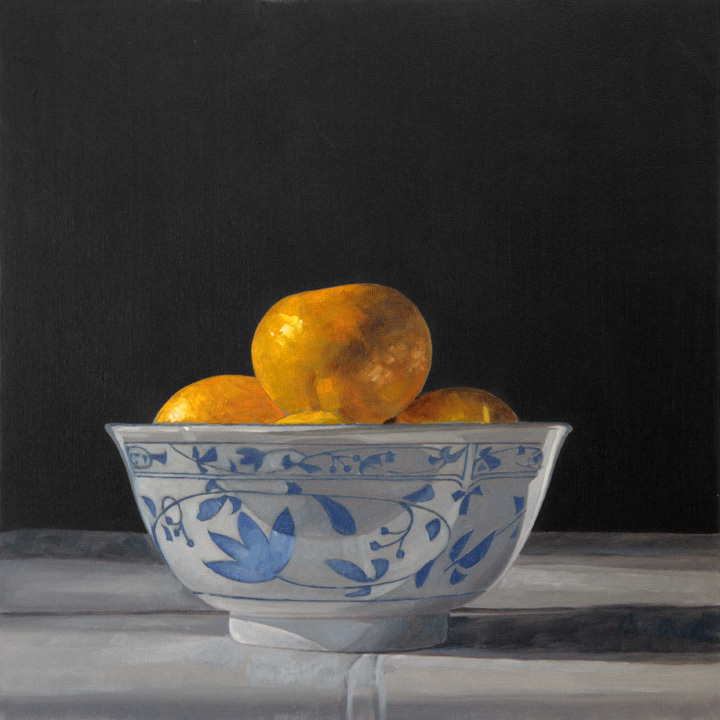 I wasn't able to pull off a win in Katherine Tyrell's, "Best Picture of the Year on an Art Blog", but I did come in first in the Still Life category. In the overall, I was only able to secure a third place (tie) with Jeanette Johnson - who got my vote for the Natural World category with her painting Tangle of Capelin II. I love that painting. The honor this year went to close friend and genius, Karin Jurick, for her painting Hands of Time. This is the second year in a row that she has won the title. There's no shame in losing to her, in fact it's an honor just to be chosen to participate in a competition with an artist of her calibre. Congratulations Karin, you earned it! I've been taking it a little slower the last week or so. With the holidays I thought I'd take a bit of a break. I have been doing some photography and a little trawling for new props, but gave myself permission, for the most part, to be a little lazy. Monday it's back to work. In the meantime I'll be playing with my new iPad, which I loooooove! 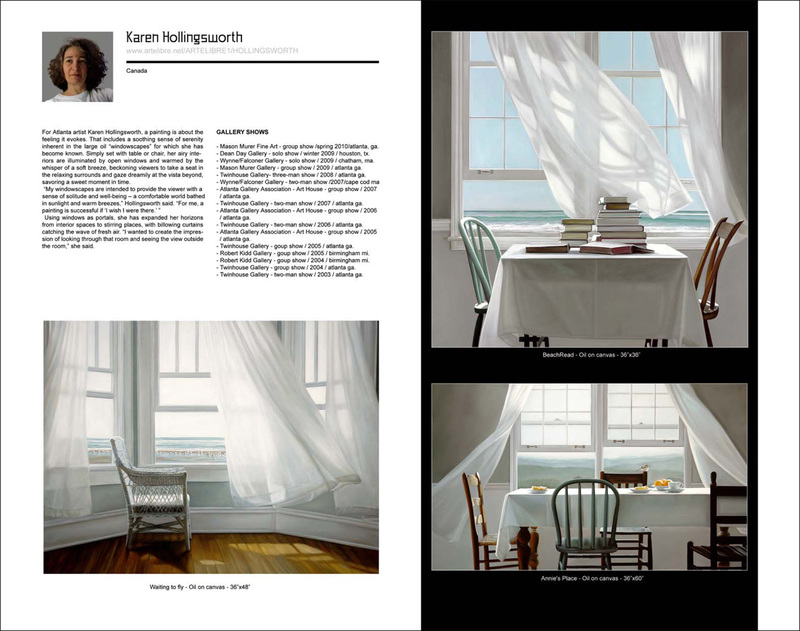 (Thank you Karen) I'm really looking forward to finding ways of integrating it into my art career.